Director Lenin Bharathi’s first film has travelled to more than ten film festivals in the two-year delay since its shooting finished. "We knew this is a story that transcends time. The issues in this film are those we’ve seen across generations." Merku Thodarchi Malai is Lenin's first film as a director, but this isn't his first tryst with cinema. He’s previously been credited as the writer for Aadhalal Kadhal Seiveer. 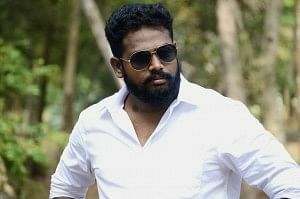 "I also worked as an AD on films like Vennila Kabadi Kuzhu, Naan Mahaan Alla and Azhagarsamiyin Kudhirai, following which Aadhalal Kadhal Seiveer happened," says the director, who claims to share a special connection with the Western Ghats that forms the landscape and subject of his directorial debut. "Till I was 11, I lived in Kombai, Theni, which is in the border of Tamil Nadu and Kerala. After coming to Chennai, the land and its people lingered in my thoughts. While that’s how I arrived at the location, the topics discussed in the film are a reflection of my political views." Tamil cinema has seen its fair share of films on daily wage workers, but Lenin believes this film is different in that it’s about workers who don't own land. “That's different from labourers. I've spoken about people who are seen only as tools and are prevented from owning anything. Their lives and challenges will be a new experience for the audience." The director wanted relatable faces for the characters. "We wanted them to look believable, and so, we steered away from those who already have an image. I wanted actors to showcase the actual people there," says Lenin, who shares that he refused an offer from the film's producer Vijay Sethupathi to star in the film. "His physique didn't match the character who walks the length of a mountain every day. Also, by the time we began shooting, his films like Naduvula Konjam Pakkatha Kaanom and Pizza had come out, and he had acquired an image. All the actors in the film are new, and even Gayathri Krishna, who went on to act in Joker, was a newcomer. Most of the side characters are actual residents of the villages we shot in." MTM's cinematography by Theni Easwar has come in for particular praise. "We were clear at the time of scripting that this film not have the usual compositions. We stayed away from regular close-ups and chose instead to have shots that would give the viewer the feeling of being there. Before narrating the story, I took our art director and cinematographer to the location, and as land is the key subject of the film, we showed open spaces everywhere. I'm glad it has got noticed." The film's pre-production took as long as three years. "We stayed at a house in the village, and Anthony, who plays the lead character, spent a year there and worked with other labourers there as preparation. Gayathri was introduced as a friend's sister from a difficult family and was given a job at a cardamom factory. She also spent a lot of time with fellow workers to get the body language right," says Lenin. On his producer, Vijay Sethupathi, the filmmaker says, "Our friendship began during the Vennila Kabadi Kuzhu days (in which Vijay Sethupathi played an uncredited role). While he was shooting for Pannaiyarum Padminiyum in 2013, I asked him to refer me to a small-time producer. After a week, when I was discussing the script with him, he said he would do it himself. He also said he didn't have the money at that point of time but told me to start with pre-production work." Another big name associated with the film is its composer, Ilaiyaraaja. Incidentally, the region where the film is based is the native place of the legendary composer, who’s also supposedly the childhood friend of Lenin's father. "Originally, I didn't want to approach him because he is connected with my family. Thankfully though, his knowledge of the landscape enabled him to say a lot of things with his music," says Lenin. Ask him about the general perception that award-winning films may not be too attractive for the average viewer, and Lenin says, "MTM will break this cliche. We took the film to festivals to gain recognition, not to win awards. In Tamil cinema, releasing a film without major artistes is a challenge, and we hoped this recognition would help overcome that hurdle. The politics of this film needs to reach the underprivileged." Speaking about his next, Lenin says, "I'll only make films whose topics deeply affect me. I've got four scripts ready, but considering I spent seven years on this film, I'd need at least two months to drain it out of me." Will it take him as long to make his next? Lenin laughs and says, "I can make a film bi-annually if I want my kids drive around in a car or live in a bungalow. But I feel the visual medium needs the right focus. In Twitter, Tamil films are trending more than Kerala floods, and that's disheartening. Doing a regular film or a script that worships its hero isn't what I want to do. I understand my responsibilities as a creator. Filmmakers get more recognition and salary than those who work harder; so I wouldn't mind taking even 10 years for my next film."